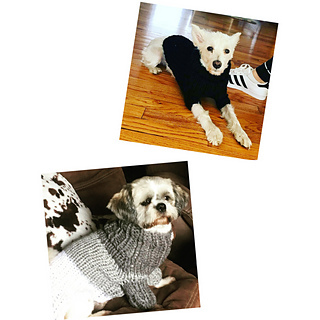 This Handknit turtleneck sweater will keep your dog warm in the winter months. Turtleneck, leg sleeves, and chest section are ribbed for a snug fit. Made in one piece seamless from washable wool. Knit Picks Wool of the Andes 100% superwash bulky wool, 137 yards,, 100g/Hank, 1 (1, 2, 3), coal (26502) or from other color and yarn of your choice. Yarn calls for needle size 11 (8mm) but for this project this needle size is used just for ribbing of back. The circular needle size 17 (12mm,) is used for the knitted stitches and rest of body for a stretchy fit. yarn needle, scissors, waste yarn, and stitch holders. If using more than one color, you can use the joggles join method. For the holes of legs use a provisional cast on while join yarn to work legs. This gives a seamless look. The under legs stitches can be held on a stitch holder. Please let me know if find issues in pattern.